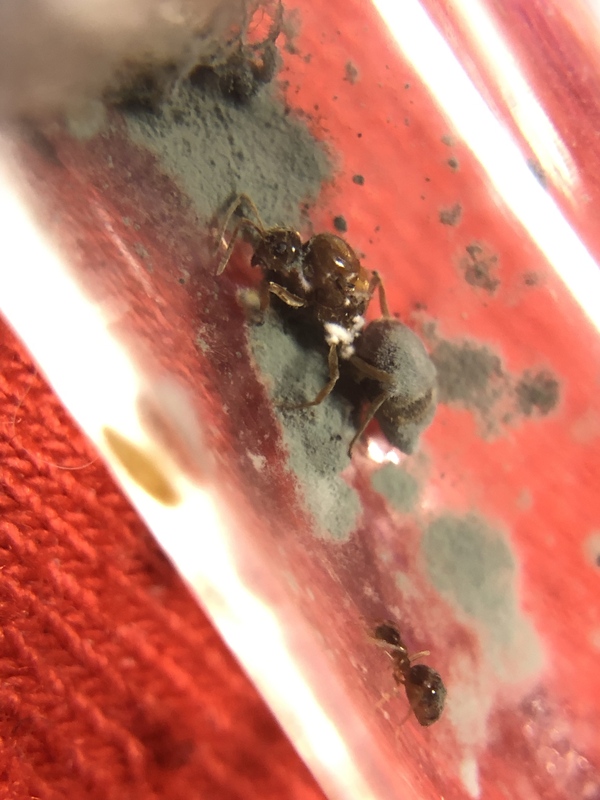 In addition to my Camponotus hyatti journal, I’m going to start a journal on my new Prenolepis imparis queens and their future colony together. Okay so first off, I caught the the first queen on Feb 1st, at 3:14 pm while exiting my school with one of my friends. 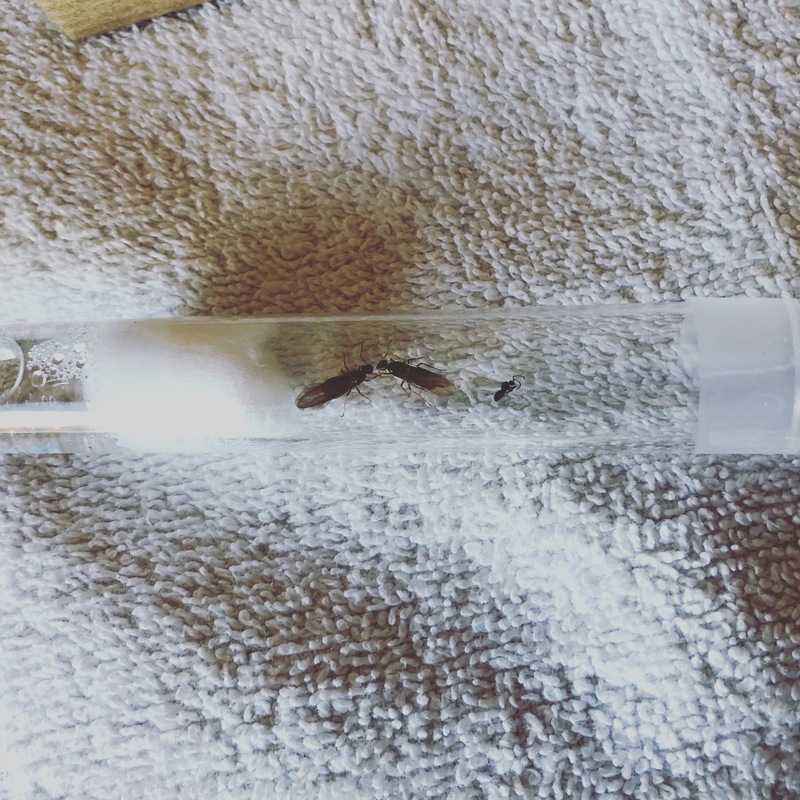 Another friend had given me a test tube at lunch so when I saw the queen on the ground I took out my test tube, which already had an aphaenogaster male alate inside of it, and put the queen in there. I wanted to see how they’d react, but they really didn’t mind each other. I thought the queen was Lasius sp. at the time. Literally that night I had a dream that I found a Prenolepis imparis queen because I’d been thinking about them so much. 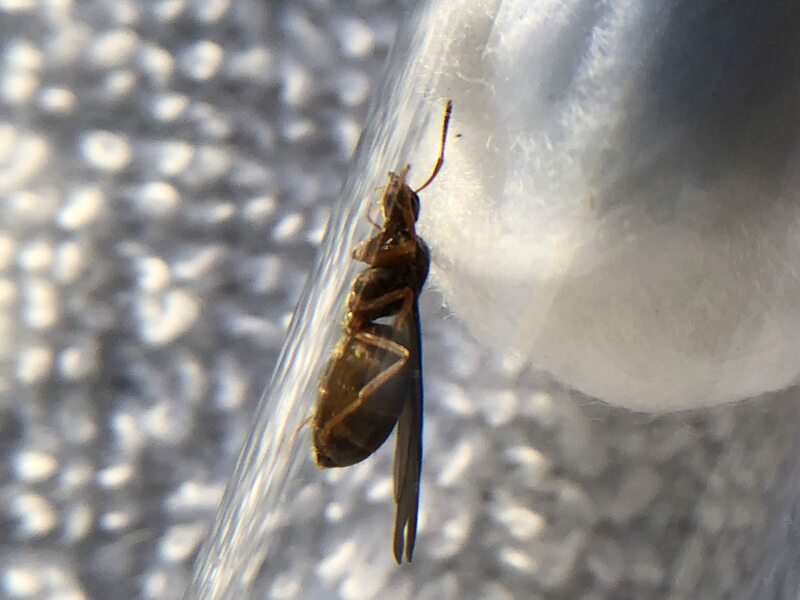 Then the next day, on Feb 2 at 3:48 pm, as I was talking to people in an Instagram ant group chat about how I can never find any Prenolepis imparis queens, I saw a Prenolepis queen mating with a male right beneath my feet as I was approaching my doorstep. I immediately put the queen and male in a test tube. Yesterday I just got confirmation that the two queens are infact Prenolepis imparis. Its cool how these queens still haven’t dropped their wings. It just goes to show that the method of looking to see if a queen has lost her wings will tell you if a queen is fertile or not, is false. That wraps up the first entry of my journal, and I’ll update it more when something happens. On March 26 I had checked on this colony to find that one queen had died and the cotton was very moldy. I had to move the queen that was alive into a new tube and I put her in a wine cooler set to 60F. The cold temperature triggered her to break off her wings. As of now I don't know if she has eggs yet but her gaster is swollen which is a very good sign. 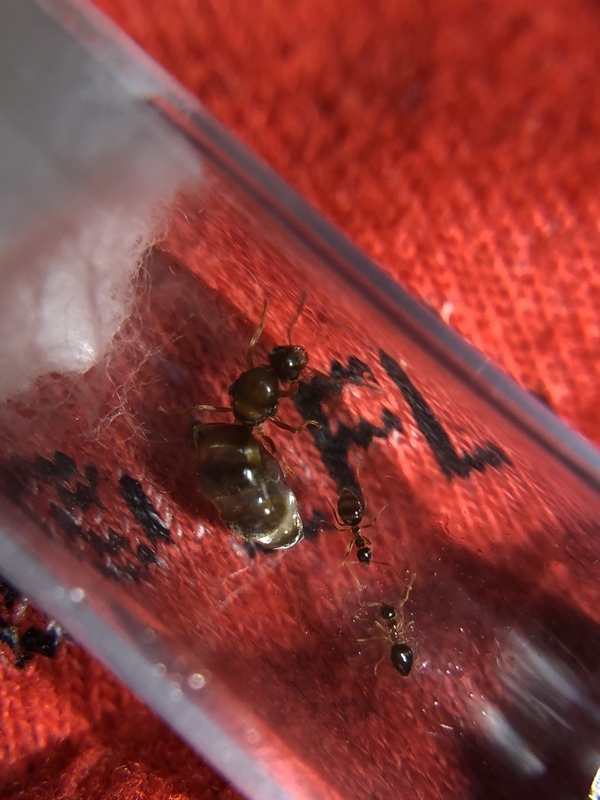 You shouldn't put two queens together unless they have a way to get away from each other, even if the species is known to have multi-queen colonies. I suspect that the survivor killed the other one. If you try something like this again, give them an out world, or something similar, so that, instead of killing the other queen, she just chases her out of the cholesterol chamber. I doubt it. The queen looked like she was infertile anyway. There were no signs of an attack. 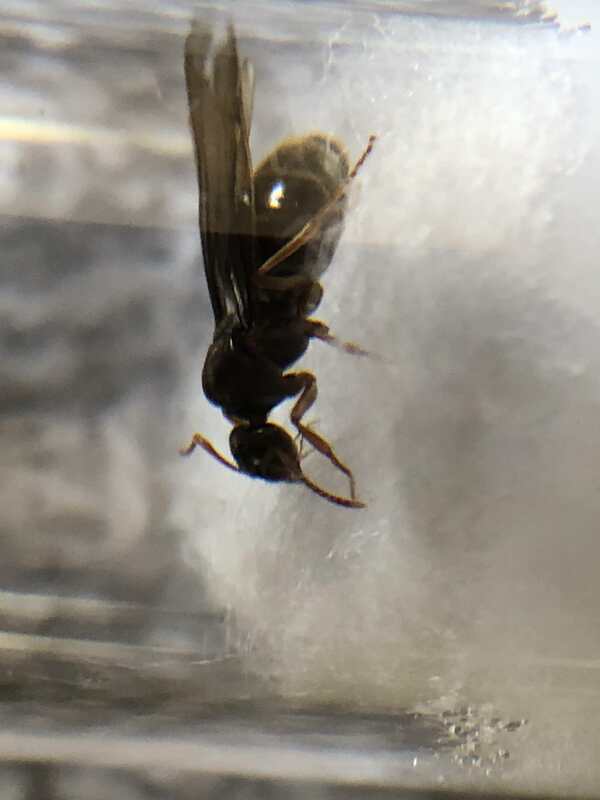 February 1st, 2018: I caught a Prenolepis imparis queen at my school. The next day I found another one at my front doorstep. March 26th: I found the cotton in their tube completely molded over with one queen dead. I moved the living queen into a clean tube and put her a wine cooler, hoping that would trigger her to finally shed her wings. The next day she did so. She ended up spending the whole summer and the beginning of Fall in the wine cooler due to my mom locking it and losing the key, which might have contributed to the colony's eventual downfall. May 5th: I found her first eggs. May 27th: I counted about a dozen eggs. 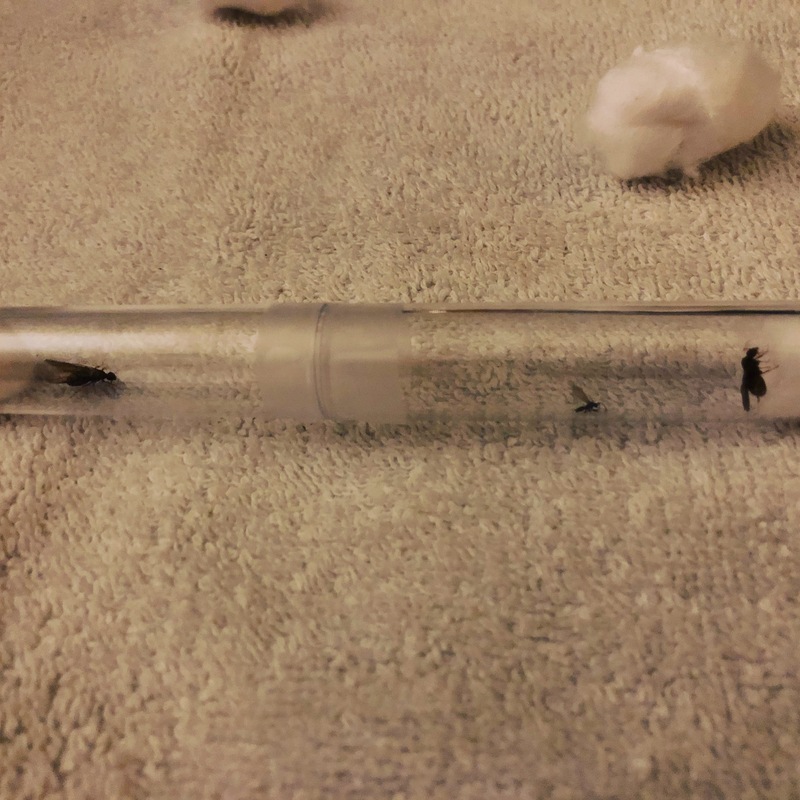 October 5th: I was finally able to remove the tube from the freezer and found the queen with a worker and brood. The tube was moldy so I moved them to a new one. October 23rd: I found all the brood gone except one pupa and egg. November 15th: The colony had its second worker. I found that the egg had disappeared. They must have eaten all the brood for some reason. I decided not to overwinter them as I've read that wild colonies nest deep enough so that they maintain warmth throughout the winter. January 1st, 2019: I moved the colony to a new test tube due to their previous tube being severely moldy. January 8th: The colony had a severe mold outbreak with the queen and one worker succumbing to the mold. I put the colony in the freezer to kill the last worker.